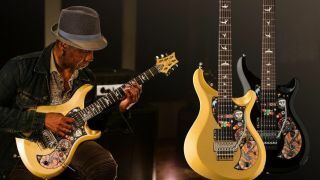 PRS’s first offset guitar, the S2 Vela, is a winning formula, so we’re pleased to see Living Colour founder Vernon Reid serve up his own take on the outline with the S2 VR Vela. Reid’s Vela replaces PRS’s hardtail bridge with a Floyd Rose 1000 Series locking vibrato, while two HFS pickups provide the firepower. A V-shape neck is also onboard, while the psychedelic pickguard was designed by Vernon himself. The guitar will be available in two finishes: black and Egyptian Gold. A limited number of S2 VR Vela guitars will be made, but the order window is open from 8 August to 30 September - prices TBC. 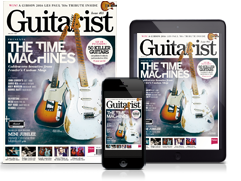 Head over to PRS Guitars for more info.